Although it is by no means the only player on the field, Sterling has done more than any other label in presenting what you might call "the obscure" Raff. It has issued four discs (Music for Violin and Orchestra CDS1075-2; Operatic orchestral extracts CDS1085-2; Te Deum CDS1098-2; Tageszeiten CDS1089-2). This double album gives Raff collectors and others the fifth and sixth CDs. Even if not every one of the site's reviewers was convinced (review) this is a remarkable piece of work and, who knows, there may be more to come. For a Raff volume, forming part of Sterling's Swiss Romantics series, what justifies the first track being a Liszt collaboration with Raff? Although speculation remains, it does seem clear that Raff worked closely in support of the older Liszt from 1850 to 1856. This would have included duties as an orchestrator of the symphonic poems between Ce qu'on entends sur la montagne and Hunnenschlacht. The Prometheus Overture, as befits its legendary subject, feels more recent than its 1850 vintage. While Bernard Herrmann famously recorded Raff's Fifth Symphony Lenore for Unicorn (Unicorn-Kanchana UKCD 2031) this overture would also surely have appealed to the film composer-conductor. It is racked with a very modern cauldron of catastrophe and torment: swirling strings, groaning brass and stern woodwind. The Göteborg Operaorkester and Henrik Schaefer (who also presides over the Te Deum disc) give it a notably turbulent outing which underscores the potential indebtedness of Tchaikovsky's Francesca da Rimini (1876) and Hamlet (1889). There's even an excitingly stertorous foreshadowing of Tchaikovsky's Fifth Symphony (1888) towards the end (14:00) as well as, right at the end, some triumphant fanfaring redolent of Les Préludes (1854). I have not compared the two but this work is, it seems, a different and distinct piece from the Liszt Symphonic Poem of the same name written in 1854, premiered in Braunschweig in 1855 and published in 1855 with Liszt's final revisions. The overture from Raff's incidental music to the drama Bernhard von Weimar is about the same duration as the Prometheus Unbound overture. Once again it is more of a symphonic poem than an overture. It's a shade four-square and Teutonically stiff and sturdy towards the end. For the most part an engagingly serious rather than charming piece, it is well worth encountering. You will notice, however, the Göteborg Operaorkester's violins which too easily take on a glassy edge, for example at 6:20. Then come two marches from the same drama - one each from Acts III and IV. They receive here their first performances since the 1920s. These are jaunty and regal pieces and in the case of the first of them there is a sauntering trio section with some attractive brass solos along the way. The second march has a soothingly smooth nobility which rises most magnificently at 2:20. It again makes that ascent in the last three minutes but ends on a glowing downbeat. Enthusiasts for music of the period should not miss this. These two eight-minute marches carry a sense of story-telling. We are not dealing here with jingle, swagger, polished leather, shiny metalwork and bombast. All this music dates from the summer of 1854 when Raff wrote it for a play by the man who would become his brother-in-law in 1859. CD 2 is devoted to nine orchestral intermezzi from Raff's triptych oratorio: World's end - Judgement - New World. This was completed within a few years of the composer's death. It is an obviously ambitious project - one of the most ambitious. The Pestilence - Allegro is a surprisingly smooth depiction of the depredations of disease. There is more horror in the Prometheus Overture. Similarly, one has to work hard to interpret anything particularly savage in the War - Andante movement. It's lively and determined music-making certainly but no more than that. Famine - marked un poco piu mosso - is thinly scored, almost frail, but one is not aware of anything especially skeletal. Death and Hell - designated L'istesso tempo - is quiet and not volcanic or terrifying. Later in its 5:39 span Raff does add some tensely marching trumpet fanfares fit for the Duke of Hell. His whirling violins in this piece are possibly influenced by Tchaikovsky's Francesca of five years earlier. It's a natural extension of the Famine movement. The Last Signs is very inventive with some magically high, gleaming writing for the violins and a fantastical Berlioz-like atmosphere. One can sense a composer straining at the conventions of his time to create something extraordinary and forbidding. He was perhaps influenced in some measure by Berlioz's Symphonie Fantastique and Mussorgsky's A Night on the Bare Mountain. In the German tradition it would take another half century before such terror and exaltation could be more faithfully voiced as they are in Franz Schmidt's Das Buch mit sieben Siegeln (1935–37). The Last Trump is a comparatively subdued Adagio; not at all Apocalyptic. The Resurrection is a smoothly reverent Adagio rising to a grand statement. The Judgement is another Adagio – silvery, breathlessly projected violins with a trumpet descanting above. This is extremely effective. Given the predilection of conductors to champion sequences of operatic gems into concert pieces (Pfitzner and Strauss have had or invited this treatment) it is surprising that this gem of a movement has not been collected together with some of the other movements on CD 2 to produce a well-balanced suite. The final extract is a serene Andante which seems to promise peace as a natural extension of the previous track (The Judgement). Raff holds tight to the tension which characterises much of his invention across these nine pieces. The excellent 26-page essay by Dr Avrohom Leichtling lavishly incorporates music examples and is in English only. This album capably makes the case for a complete recorded revival of: World's end - Judgement - New World. 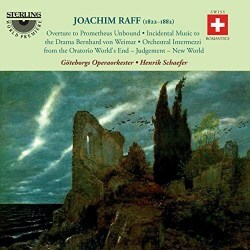 Generally, Raff emerges with much honour and credit at the other end of the experience of hearing this music. It can only result in people wanting to hear more by this composer.